Vitis vinifera Solaris - Super Sweet White Grapes for table or wine making! This grape vine in a fantastic vigorous climber that is not only attractive, but can also yield bunches of tasty grapes to eat either straight from the vine or even used to make your own Muscat-honeyed flavoured wine. Vine leaves can also be picked fresh to use in other Mediterranean inspire dishes in your kitchen. Growing well against a warm sunny wall or fence, over a pergola or trellis, this is one of the easiest grapes to grow, and fully frost hardy. The best crops are produced in long hot summers, and it will take a season or two before you see any, but once established it will grow quickly, and can last for decades. A real talking point is to grow near an entertaining area out doors so you can pick the grapes and offer to guests at that summer barbecue or marvel at them as you sip a glass of your own vintage - either way, this easy to grow vine will earn you green fingered bonus points with your guests with its freely produced large bunches of sweet tasting gold-green, seeded grapes year after year. In Autumn, the plant provides a further display by way of foliage turning butter yellow, often with hints of fiery red before it falls away for the winter months. 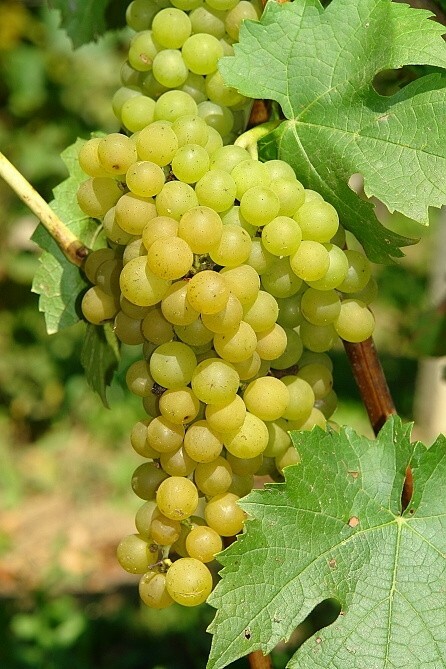 Supplied as a strong plant, this Solaris Grape Vine is a modern, relatively recent introduction producing early, heavy crops with a high sugar content. Your vine will arrive in an approx 2-3 litre container, ready to be planted out and romp away in your garden.